Parksville / Qualicum Beach's only Apple Certified Macintosh Technician (ACMT) and Apple Support Professional, Dan LaRocque, posts semi-regular tips and blogs about his day-to-day experiences with Macintosh computer technology, social media, web marketing & design and other technology related developments. Lots of emails this week about the new Adobe Flash update and how to install it. They seem to update this plugin every 4 to 6 weeks, and it's essential to many online services like YouTube videos and other sites. First, go directly to the Adobe.com website and navigate to Downloads. 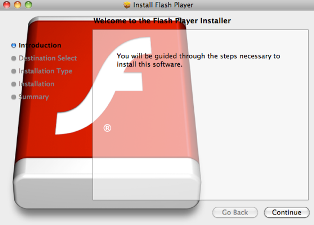 Select the Adobe Flash update and click to download. Now this is where most people get tripped up. After downloading the software, you still have to go through several steps to complete the install. Locate the update .dmg (disk mounted image) file in your downloads folder. 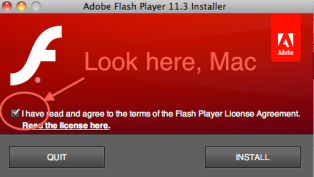 Double click to launch the installer. Choose the volume where you wish to install the software (your Macintosh HD) and follow the prompts the installer presents. It will require that you close any browsers, Safari, Firefox etc., before continuing. You also have to agree to the software terms and conditions. Once you've completed all of these steps, you should be good to go. You can add an auto-responder to your email, so that all incoming emails are automatically responded to with an instant and consistent message. This can be handy when on holiday, or for many other reasons. Go to your Preferences menu in your Mail program and navigate to the Rules panel. Choose 'Add Rule' and give your new rule a name. Select a parameter from the list (ie., sender in address book, subject includes, etc.) choose to reply to message and type in your chosen reply. Apply rule. Your email program will auto-fill the address of any recipient you may have emailed in the past. To edit or delete a previous recipient, navigate to the 'window' menu in your top menu bar, select 'previous recipients' and clean up any addresses you no longer wish to autofill. Your emails don't have to go out with the same old default signature 'Sent from my iPhone'. To customize this line, go the settings icon on your IOS device home screen, choose 'mail, contacts and calendars' and navigate to the signatures tab. Swipe the arrow to the right and input the signature of your choice. 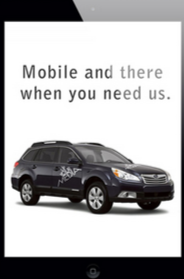 Every iPhone or iPad user should install and deploy this free app from the App store. Launch the app and sign in using your Apple ID. If you should ever misplace your iPhone, or have it stolen, you can login to iCloud from any other computer and find your device on a map. You can also play a sound on the iPhone to help you locate it, you can lock it and you can even erase it. Keep in mind that the power has to be on for this feature to work, a smarter thief may be able to power the device down to avoid detection. It's easy to add a shortcut to your favourite website to your desktop, simply open the website in Safari, grab the favicon to the left of the website address in the toolbar, and drag it to your desktop. To change the icon, copy an image you'd like to replace it with, click the icon in your desktop, choose Get Info, and paste the new image onto the old one. Your email goes out with your account profile picture in the top right corner. To change the picture displayed in your mail, go to your Address Book and find your User Card, indicated by the icon shown. Double click on the photo or image displayed, then click Choose to navigate to your iPhoto library and choose a new photo, or through your folders to find another image. You can also use the camera to take a photo using your iSight camera. This 3rd party application, available for free at your App store, actually works to locate and delete exact iPhoto duplicates. Free up a little disk space and trim down those annoying duplicates. Create PDFs with the print function. The easiest way to create a PDF (portable document format - the best format for sharing documents across multiple platforms), open your document in the application where you created it, (safari, pages, word, mail) click print, in the lower left corner of the dialogue box, open the 'pdf' drop-down box and choose 'save as PDF'. Merge multi-page PDFs with Preview. Now that you've created your PDF with either the print function, or with your scanner, you can merge multiple one page documents into single documents with multiple pages. Use preview to open both documents, choose the View menu and select 'show sidebar'. Drag the document's icon from the sidebar directly over top of the second document's icon and save the new multiple page document. This one's easy. When browsing in Safari, you can mail the contents of your page by going to your file menu and choosing 'mail contents of this page.' or 'mail link to this page'. You can transform your Pages documents to All Caps, Small Caps or none, using the Format > Font > Capitalization feature in the Format drop down menu. Your Startup Disk Is Almost Full - But not for long!